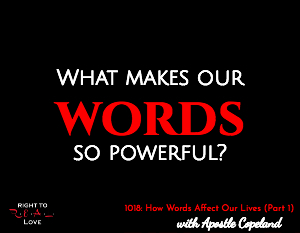 In this episode, Jay is joined by author Apostle Copeland to address the question: What makes our words so powerful? What makes our words so powerful? How the words you speak are affecting your life. Why it is important to be aware of the words that you allow to come out of your mouth. The importance of thinking before you speak. What makes our words so powerful. Why we must honor God. Acknowledge that “wanting” to change how you speak isn’t enough, you must invest in making the change because your words have the power to determine your destiny. Commit to doing a personal study in the Word of God on words in order to learn God’s perspective and how to honor God with your words and speech.